By D. Brad Hatch, Ph.D. This month’s blog continues our series highlighting the artifacts recovered from the Squirrel Creek site in Randolph County, North Carolina. 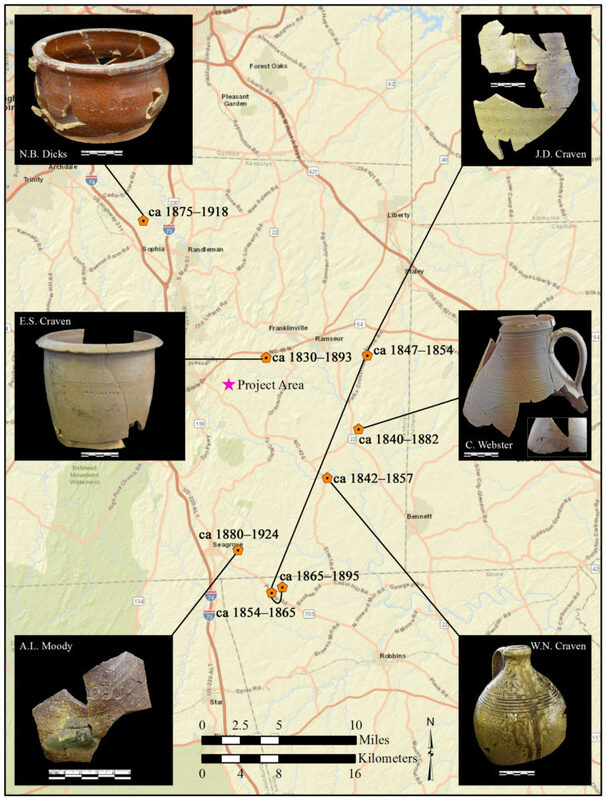 On behalf of the North Carolina Department of Transportation (NCDOT), Dovetail Cultural Resource Group conducted data recovery excavations at the site, guided by the data recovery plan authored by NCDOT (Overton 2014). The artifact discussed below initially appeared to be one of the most unassuming in the collection, but in the end, was one of the most confounding for us in terms of its use. During the excavations around a standing stone chimney, archaeologists recovered a cast iron block measuring 8.5 inches long by 3 inches tall by 4.5 inches wide and weighing 24.5 pounds (Figure 1). This object, known in the field as the “iron brick” due to its size and shape, was discovered in a layer of fill that extended into the western hearth and appeared to have been pushed up against the chimney sometime during one of the logging episodes that occurred on the property in the twentieth century, after the site’s occupancy (Figure 2). The purpose of the object was the focus of much speculation on site and continues to be, even now. Figure 1: Iron Block Recovered from the Squirrel Creek Site. Figure 2: View of the Western Hearth where the Iron Block was Found. Based upon its association with the hearth, several hypotheses have been put forth relating its use to heat or food. 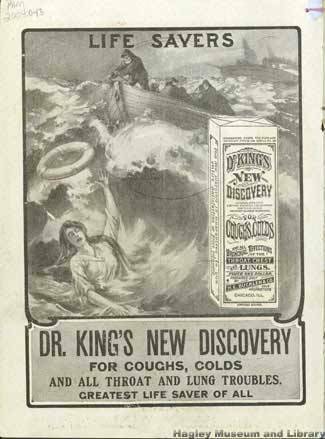 Some have suggested that it could have been used as a source of heat. Having been heated in the fire, the iron block could have been placed in a container to act as a foot, bed, or food warmer. Another hypothesis is that it could have been used a small anvil for light metal working in or around the house. Perhaps the best-documented hypotheses for the use of this object comes from one of the descendants of a previous owner of the site. Hal Pugh is the fourth great grandson of Samuel Trogdon, who owned the property on which the site is located in the late-eighteenth century, approximately 30 years before the dwelling at the site was constructed. 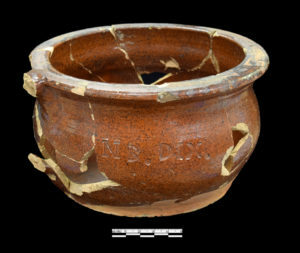 Mr. Pugh was consulted extensively, both during and after the excavation, due to his expertise on North Carolina pottery (more on this to come in a future post). However, when he saw the iron block, he immediately recognized a similar object passed down through his family (Figure 3). Figure 3: Pugh Family Iron Block (Courtesy of Hal Pugh). Considering that the iron block at the Squirrel Creek site was found in the hearth as well as the familial and local connections of the block in Mr. Pugh’s collection, it seems logical that both objects served similar purposes. Unfortunately, we have not found any other examples of an object like this in North Carolina or elsewhere, so we have been unable to confirm this interpretation. 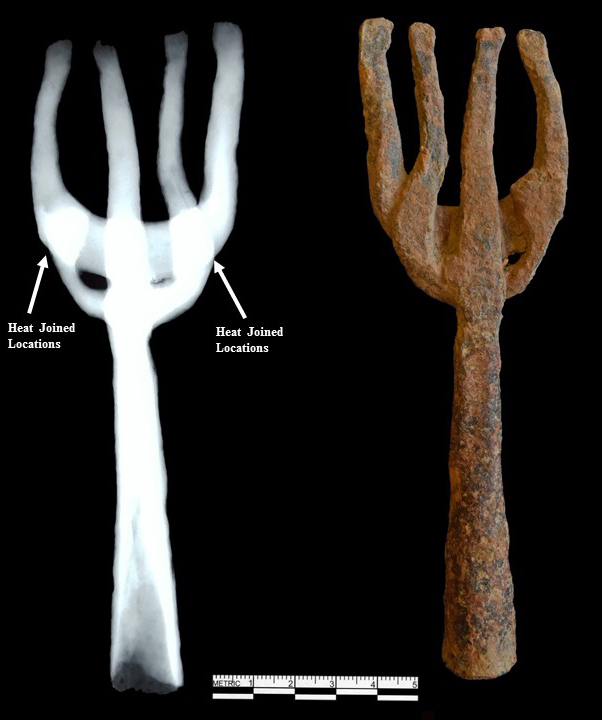 It is our hope that this post has shed a little light on this unique object and the process of artifact interpretation, and it may encourage other people to come forward with similar artifacts for comparison. If you have seen one of these, please let us know (Figures 4 and 5). You can contact me at bhatch@dovetailcrg.com. Figure 4: Pugh Family Iron Block. Dog for scale (Courtesy of Hal Pugh). Figure 5: Iron Block Recovered from the Squirrel Creek Site. Dog for scale.